This has nothing to do with Goddess and menues. 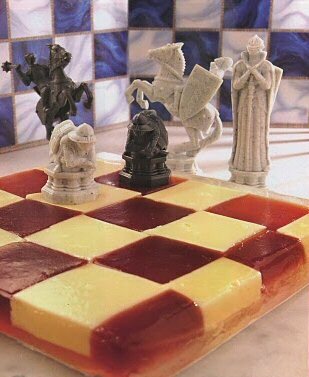 Just desserts I find extremely fascinating. Where I come from, people don't use much jellies or gelatines. That stuff is almost exclusively used as a thin layer on top of cream cakes or to give shine to fruits. Some amount is used to make puddings, like fridge cheese cake or bavarois and such. In the Latin world this thing is very popular, and so they have invented 100 and 1 different ways to serve and decorate this simple dessert. 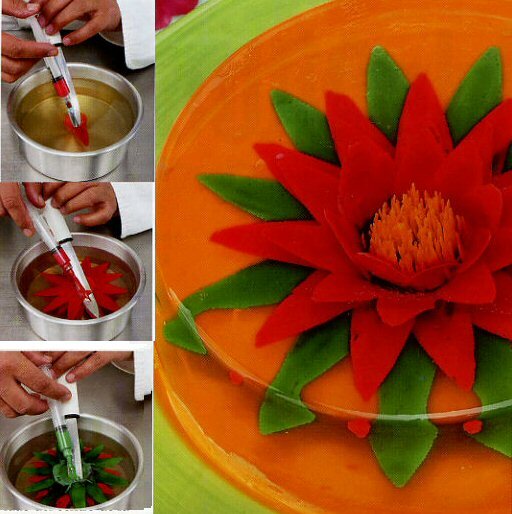 The pistils are made with syringe and the leaves with different items, like spoons and knives and filled with syringe. with just a syringe with straight or bent needle. • Use 1 tablespoon or 1/4 ounce unflavored gelatin to 2 cups of water for standard firmness. Decrease or increase water for your particular needs. 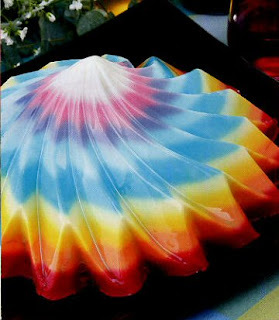 • One tablespoon of unflavored powdered gelatin equals 4 sheets of leaf gelatin. 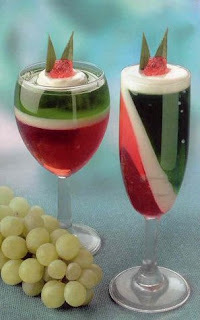 • Other liquids can be used in place of water to prepare gelatin, including juice, wine and cordial. • Pineapple, raw figs, kiwifruit, guava, ginger root, and papaya contain an enzyme called bromelain which breaks down gelatin causing it to lose its thickening properties. The enzymes are deactivated by cooking, so canned fruits are fine to use. • Too much sugar can inhibit gelatinization. The more sugar in the recipe, the softer the resultant gelatin will be. • When using sugar with unflavored gelatin, mix the sugar and gelatin first before dissolving. • Be sure to drain all solids of their liquid before adding to gelatin to avoid watering down the gelatin. 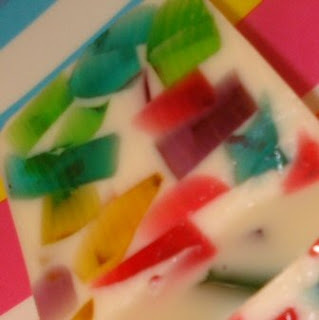 • For 2 cups of gelatin mixture, allow 1 to 2 cups of solids, either minced, cubed, or cut into small pieces. • To suspend fruits, meats, or vegetables in gelatin, chill until it is the consistency of cold egg whites. Then mix in the additions and chill until completely set. • To avoid clumping, dry unflavored gelatin should be mixed with a little cold water first for 3 to 5 minutes to moisten and separate before adding hot water. • If you are doubling a recipe originally calling for 2 cups of liquid, use only 3-3/4 cups of liquid in the doubled recipe. 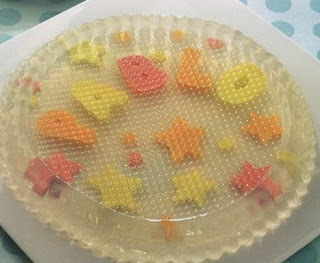 • To easily unmold gelatin, spray the mold with cooking oil before filling. If you want to avoid an oily film which might cloud the surface by using oil spray, simply rinse the mold with cold water prior to filling. Or dip the mold into warm (not hot) water to the depth of the gelatin for 5 to 10 seconds, loosen edges with a knife or spatula, and unmold. Return to the refrigerator for 20 minutes to refirm. • To easily center a mold on a plate, rinse the plate with cold water before unmolding the gelatin. • Two hours of chilling should be enough for standard clear molds, while it may take up to 4 hours for those with additions. Layered gelatins will take longer, since each layer must be individually chilled and firmed before adding the next layer. • Gelatin takes twice as long to dissolve when used with cream or milk. • Firmness varies on the ratio of water to gelatin and temperature. 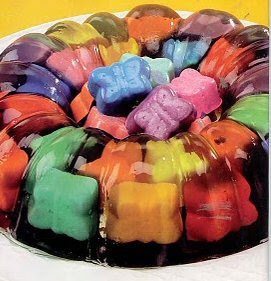 You can successfully melt down (gently using a double-boiler) and re-chill gelatin several times before the mixture loses its thickening ability. • Do not bring gelatin mixtures to a full boil or you risk losing its thickening properties. 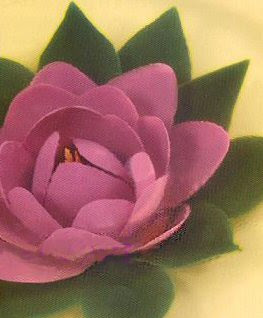 • Keep gelatin dishes refrigerated until ready to serve to maintain their gelatinous state. 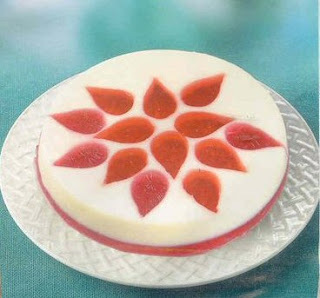 • Store gelatin desserts in a covered container to avoid the formation of a thick rubbery skin on the surface. 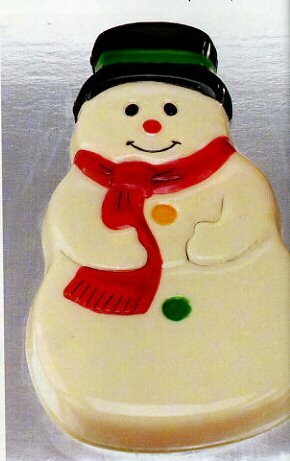 • Unprepared gelatin has an indefinite shelf-life as long as it is wrapped airtight and stored in a cool, dry place. P.S. Marshmallows are made with gelatin :-) Here's a vegan marshmallow recipe. Muito bom o post gostei muito do seu blog Parabéns !! Muito bom o post amei vou sempre visitar seu blog !! Muy bueno tu blog y estoy siguiendo su cargo por un largo tiempo!